The same goes for cakes. The longer I spend folding, baking, cooling, and frosting a cake, the less I want to slice into it in the end. Sad story, right? The same can be said for laundry, obviously. Gathering, washing, drying, air drying, folding, putting away. AAHHH. Laundry is boring and totally not delicious… so, duh. This salad though… in and out. No exorbitant amount of slicing and dicing. Just enough to create a pretty pretty salad and also enjoy your efforts. 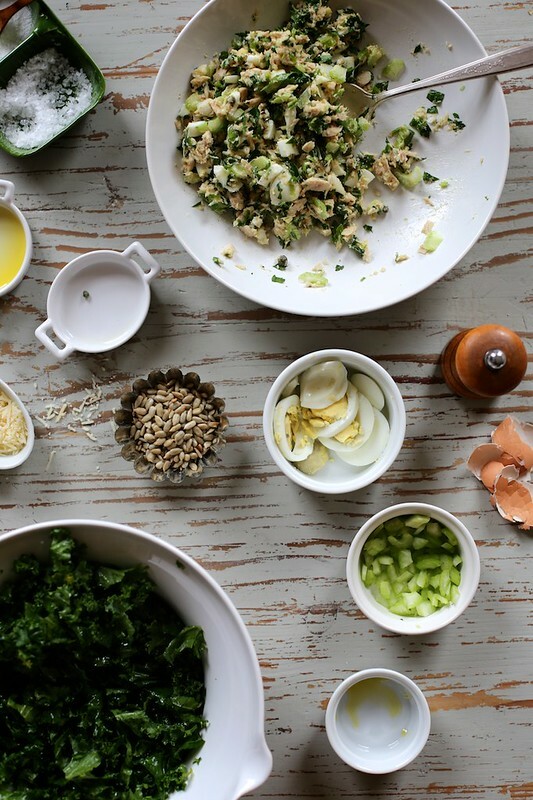 It’s the ideal balance of greens, health, and kitchen time. I hope the start of your week is feeling great! Let’s put some greens in the mix! 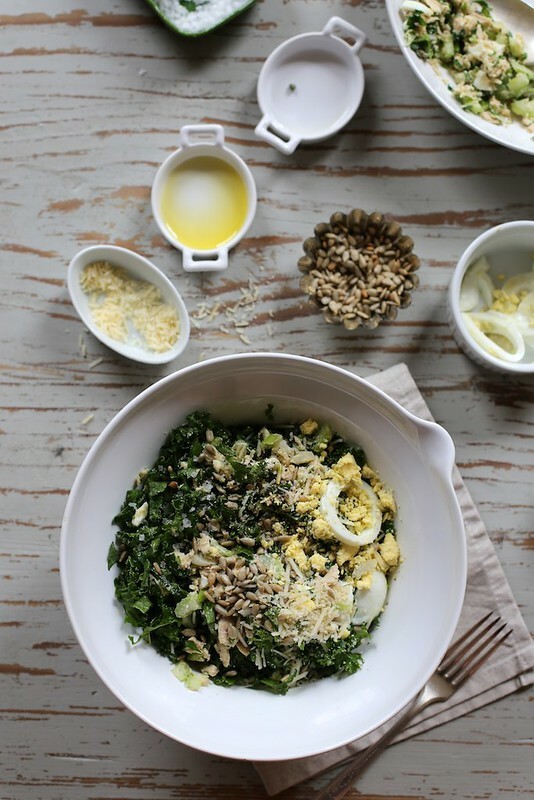 Leafy green kale + parsley, onions, and herbs + salty capers and parmesan + eggs and nuts for girth. When it comes to kale, I usually chop it small and massage (yes massage) in some olive oil and rice wine vinegar. Just a bit. This will help soften the firm greens. 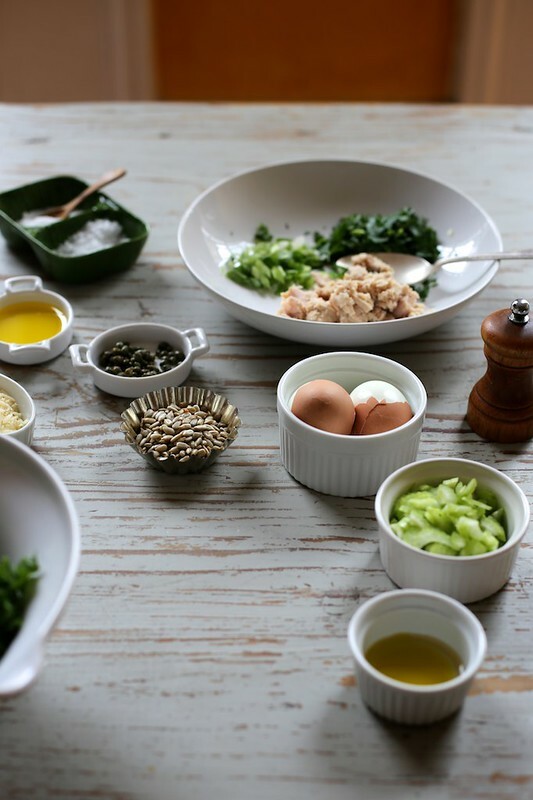 In a separate bowl I combine tuna with herbs, olive, oil, and some of the hard boiled egg. We’re going to mash together a cohesive tuna salad without the use of mayo. Capers and parmesan add an essential salty kick. Celery because it remind me of my grandmother’s tuna salad and it adds a nice little crunch. Crunchy bits and lots of green! Protein and greens bite and crunch. It’s just the right amount of healthy for the start of the week. It leaves plenty of room for the buttery barbecue shrimp that fill the streets of New Orleans… and zero kitchen fatigue, too! Toss kale in a large bowl with a splash of olive oil and rice vinegar. Season with a bit of salt and pepper and set aside. In a separate medium bowl, combine tuna and half of the sliced boiled egg. Add the green onion and parsley and a bit of olive oil and use the back of a fork to work the mixture together, breaking up the tuna and eggs. Add the sunflower seeds, cheese, and capers. Add a bit more olive oil if needed and fresh lemon juice. Season with salt and pepper to taste. 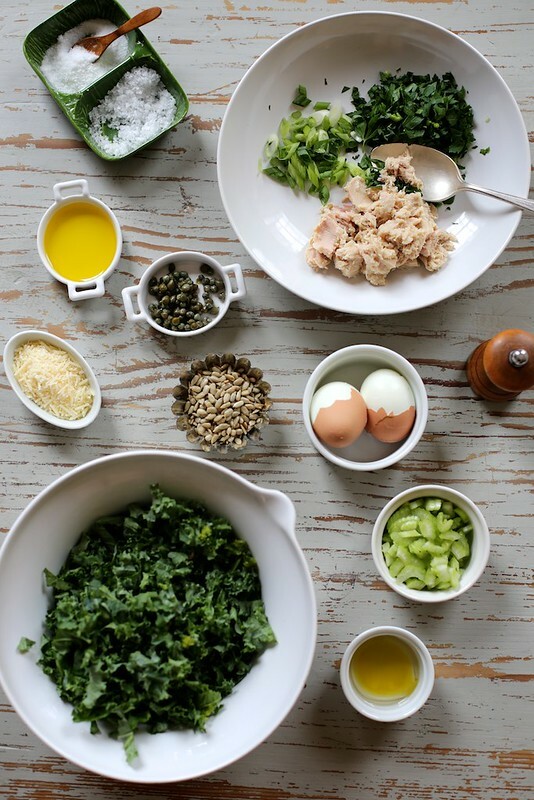 Add the tuna mixture to the kale bowl. Toss to combine. Before serving top with the remaining egg. Enjoy! This looks fantastic. 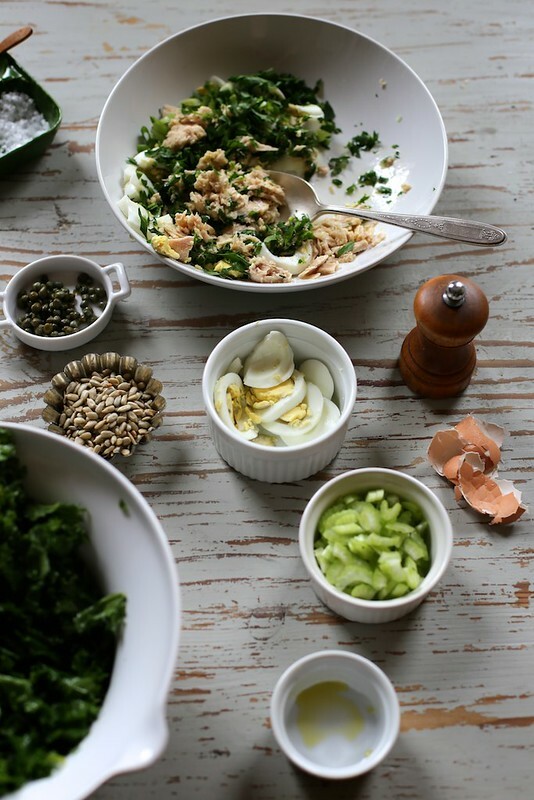 I’m always looking for tuna and chicken salad recipes sans mayo. I feel the same way when I paint my nails AND make multi-step things…and grocery shopping, afterwards I always just want to get a pizza. 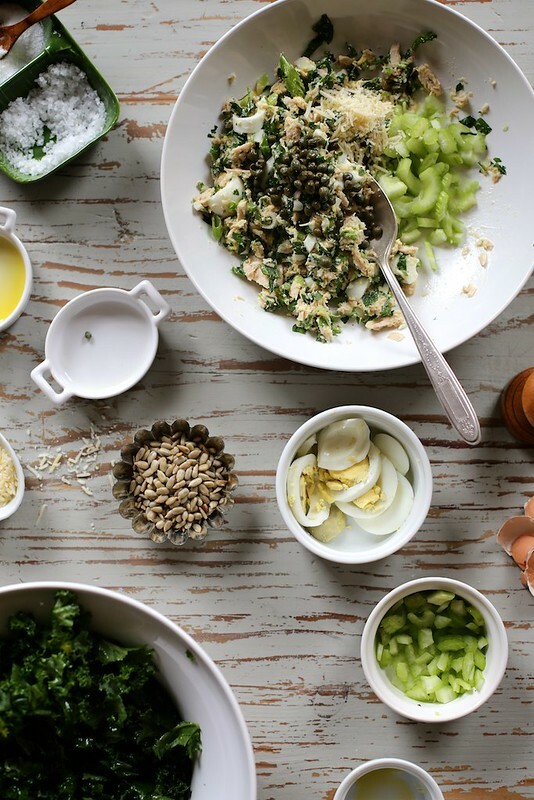 This salad looks amazing and so easy to put together…no time to get over it! Which is exactly how I like my lunch. my kind of nibbles… printed. can’t wait to try this week! Best looking tuna salad ever! Love the idea of incorporating kale. Pinned! I think that is a perfect opening statement and I laughed out loud when I read it. This salad is great – I am sharing with my CSA members this week. Thanks! I’m the same way: if I spend a long time on an elaborate dinner, I find that when it comes time to eat it, I’m not even amused with it. It’s like a couple that just got into a fight and I want to sleep on the couch alone because I’m too tired to make amends. This looks yummy though! I’m not a fan of tuna, but I bet it would be great with finely chopped grilled chicken! Completely agree I used to always make this double chocolate layer cake for birthdays and it had a layer of white chocolate mousse and a layer of milk chocolate mousse with raspberries + topped with ganache…After assembling the whole thing (and sampling all the components/cake trimmings throughout for quality control of course) I would not even want a slice of it. This looks so delicious. If only my husband didn’t think hardboiled eggs were from the devil. Pretty and simple – such a great recipe for Monday! Add capers and parm to anything and I’m totally there! Gosh too easy but I think even on your most tried days; you produce genius in the kitchen. Lovely recipe Joy. This looks delicious! The perfect thing for me to eat once I finish my juice cleanse! Also, that was the best first sentence of a blog post ever! That looks SO good! I definitely know what you mean.. it’s like when you’ve done so much cooking you don’t even want to eat.